My dear mother-in-law, Joan passed away two years ago leaving a legacy of wonderful memories and a treasure trove of keepsake recipes. I always enjoyed sitting at her table and sharing meals. From my first introduction, my in-laws always made to feel as if I was part of their family. Joan was a gracious, beautiful and uniquely private person. Our common interest in cooking buoyed our relationship that spanned twenty years. Joan did not have secret recipes. She was always pleased to share her knowledge. Before I had a laptop, I patiently copied her special recipes by hand on to 3x5 note cards. Joan dressed to the nines for an event at The Stevens Hotel, Chicago. 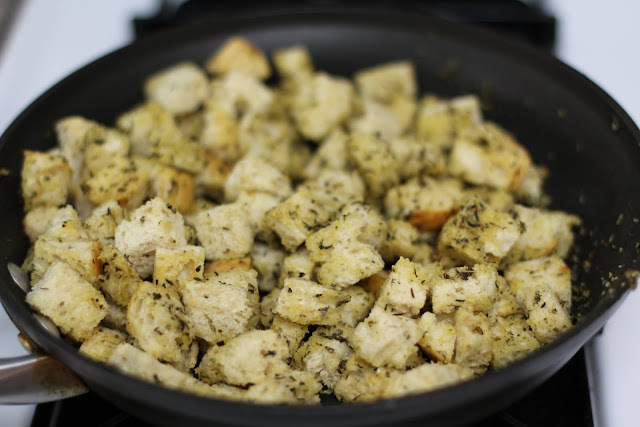 Joan tossed this dressing with red leaf lettuce and garnished individual servings with homemade croutons and toasted pinenuts. 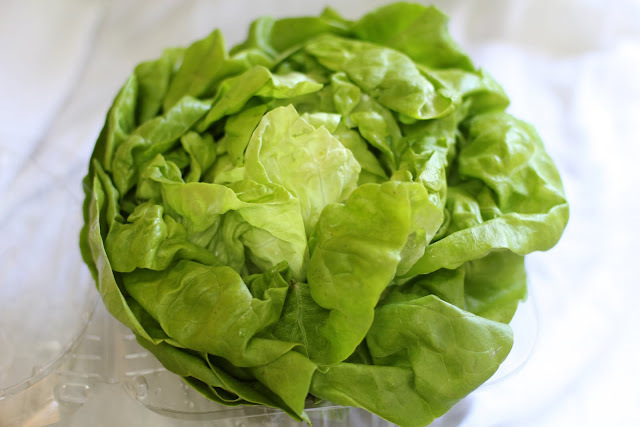 Butter lettuce also works well as does any soft, mild green or field mix. The salad is lovely with candied pecans or toasted walnuts swapped for the pinenuts. In the right season, thinly sliced apples or pears are amazing flavor builders as is shaved fennel. Sweet grapefruit might be interesting or blood oranges peeled and sliced horizontally into gorgeous thin flowers. As far as cheese is concerned think Italian. Our family is pro gorgonzola. Shaved Parmigiano Reggiano is a nice alternative for those that don't care for the crumbly blue veined cheese. We never seem to tire of either option. Or for anything Italian, for that matter. I'm not sure why, but we typically pass over tomatoes for this salad. Same with Caesar. Even though we adore tomatoes, they just don't always seem to be the right fit here. If I were to add tomatoes, I would likely choose a small tomato. A yellow pear tomato jumps to mind. Taken from the vine, and still warm from the late afternoon sun, I could be enticed to slice a few in half and throw into the mix at the last minute. 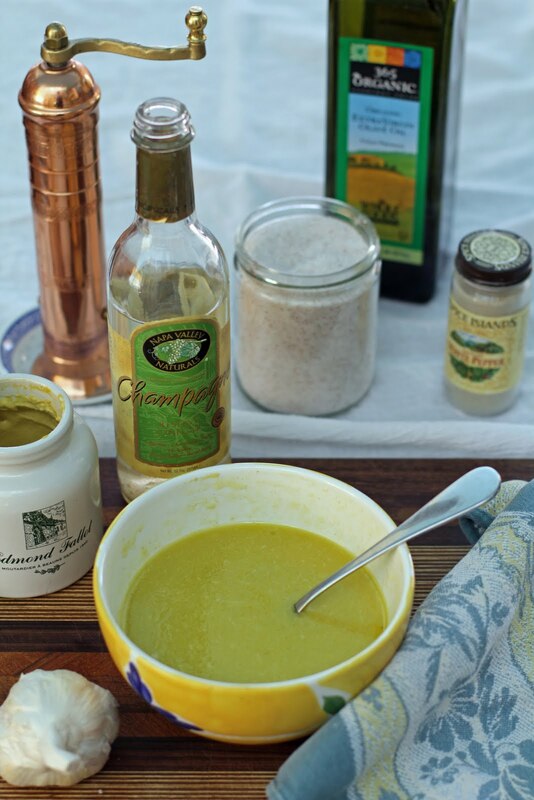 When garlic is poached, as it is for this recipe, it loses its assertive bite and the result is a pleasing, mellow flavor that plays nicely with the other ingredients in this recipe. I typically serve this salad as a first course. It's delicate and palette pleasing. Perhaps it could even be described as gourmet. I think you will really love it. If you are looking for an equally delicious salad that is a little more assertive, try our Rockin' French salad with French Vinaigrette. Either way, you really cannot go wrong. 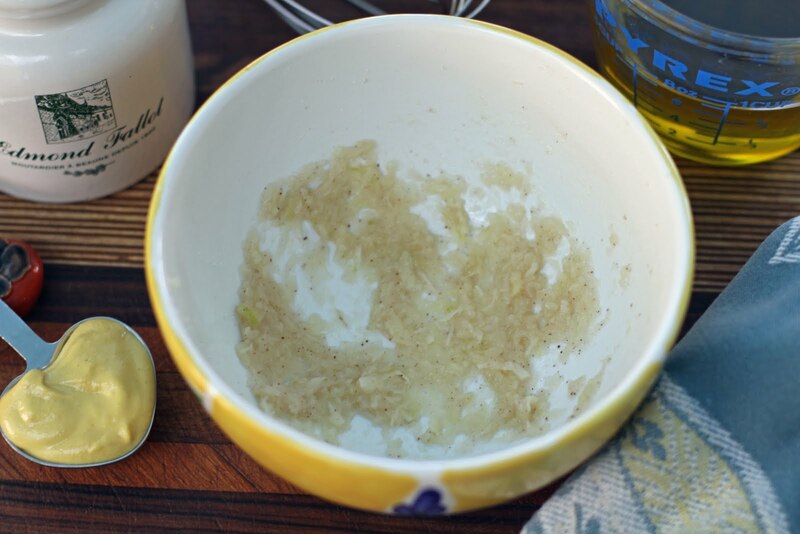 Mash the sea salt and boiled garlic to a fine paste. 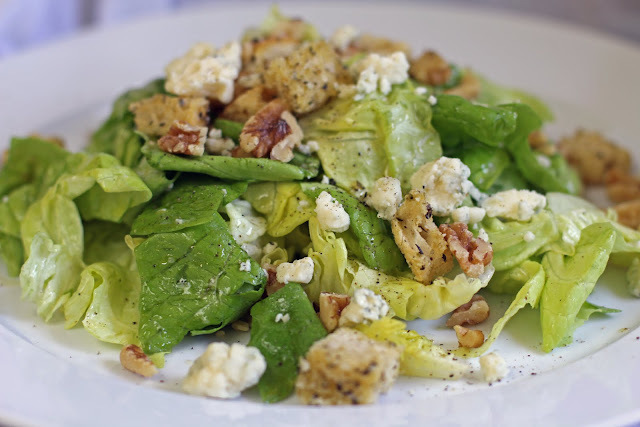 A large head of delicate butter lettuce is perfect for this salad. 2. I usually compose this salad by tossing the greens and the dressing together then plating individual portions. Garnish each serving as desired. 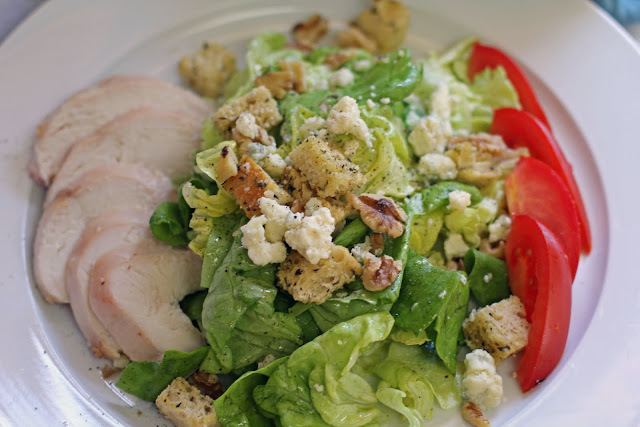 The salad as a main course paired with roasted chicken and tomatoes. Yes, some self-imposed "tomato rules" are made to be broken. Great dressing. The only replacement I have made was to use coconut vinegar in place of the one suggested above. I love California Ranch olive oil, it's great in salads.